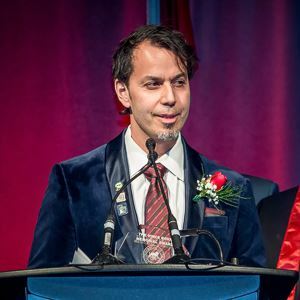 SOI donates $100,000; with a matching donation from the crowd and $100,000 in auction donations, the gala raised $300,000 for the Bruce Oake Addictions Recovery Centre! WOW! Father Sam is awarded the Sons of Italy Heart of the Lion Lifetime Achievement Award. SOI members relax at the after-party and toast to a successful Gala #33! The Friday night President's Reception is a special thank you to our sponsors and charity. 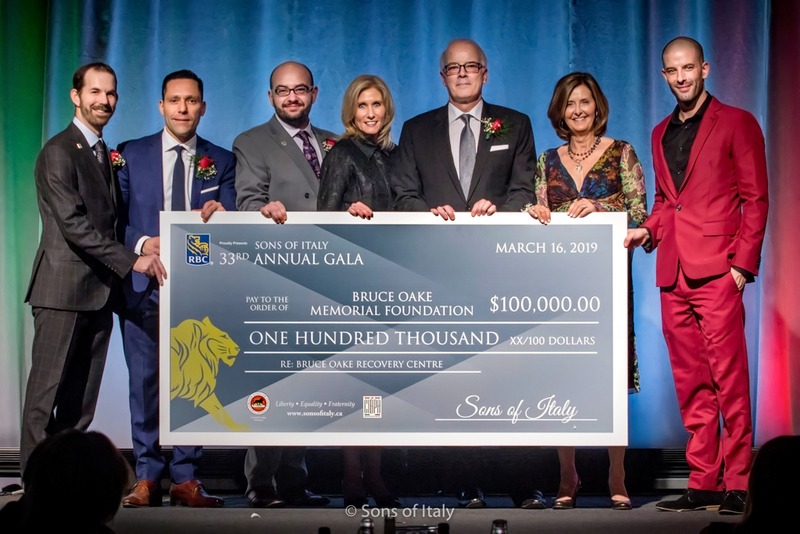 The 33rd Annual Sons of Italy Gala was a tremendous success, feeding and entertaining 1,200 attendees while raising $300,000 for the Bruce Oake Recovery Centre!! The coveted Vince Bova Award was presented at our 2019 Gala to a totally surprised member: Tat-Liang Fabio Cheam. Congrats Tat -- well deserved! 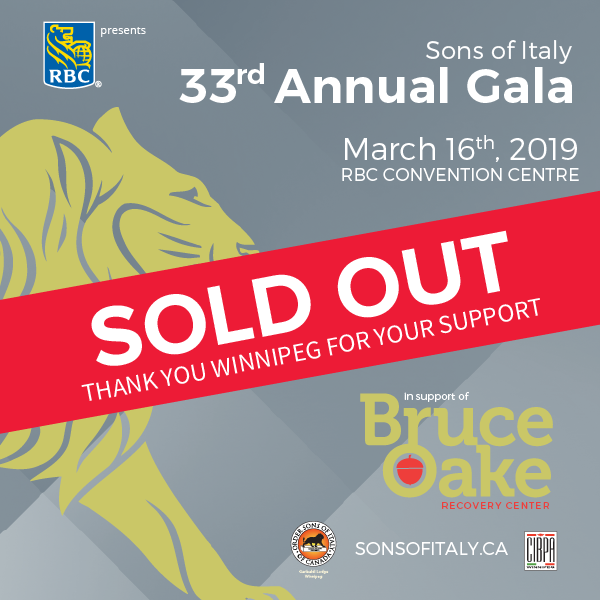 Our 33rd Annual Sons of Italy Gala Dinner is officially SOLD OUT at over 1,200 attendees. Those with tickets will enjoy an outstanding dinner, dancing and an amazing show by renowned illusionist Darcy Oake! Legacy Student Award winners announced! Congratulations to our 2018 recipients Lucas Mosienko and Francesca Silla. 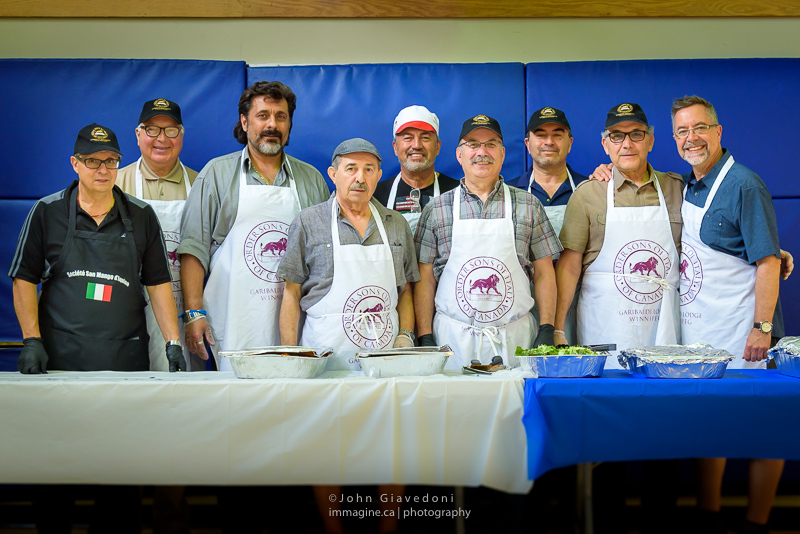 In a transformative move, the Sons of Italy, Garibaldi Lodge has changed a 33 year tradition and will now allow female members. We look forward to a new era in serving our community. 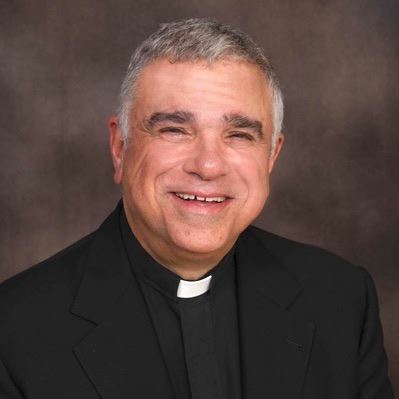 On March 16, 2019, Father Sam Argenziano will receive the inaugural Sons of Italy Heart of the Lion Lifetime Achievement Award at our Annual Gala. 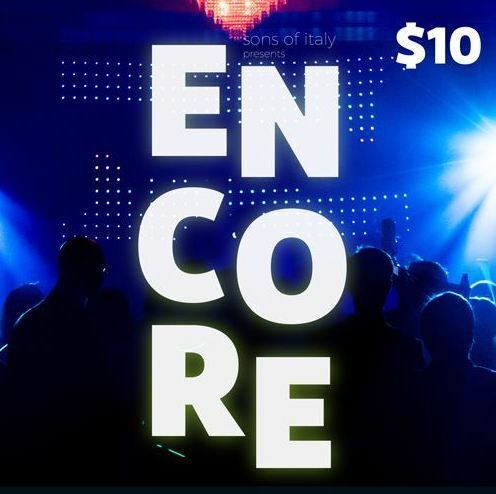 Come on down to the Sons of Italy Encore Social on Saturday, November 10 starting at 8 PM. Tickets are only $10. 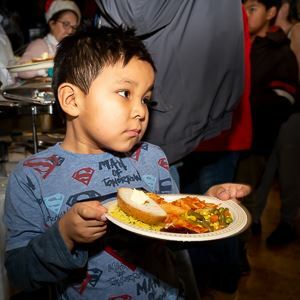 We are proud to announce the creation of a new foundation, Sons of Italy Legacy Fund, targeted to helping our youth finance their education -- and you can help us help them! Thanks to our sponsors, donors and volunteers for helping us put on this event. Check out the pictures and video. 150 graduates and their families enjoy past dinner served by Sons of Italy volunteers happy to make this special day even more memorable. SOI Winnipeg has our own YouTube channel. Check out our videos. "I can’t thank you enough for the way you bring celebration to our celebration!" - Phil Chiappetta (Co-Executive Director, Rossbrook House) about SOI's involvement in their graduation dinner.